For high-strength bonding of metals, plastics, or wood. 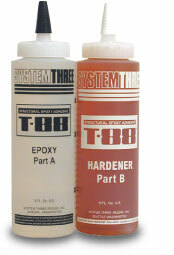 System Three T-88 is a high-performance, non-brittle, two-part epoxy adhesive designed to give superior results under adverse conditions. The adhesive may be used without modifications in normally fitted joints, and will cure in any thickness without shrinkage. T-88 is clear amber and becomes virtually invisible when varnished. T-88 exhibits outstanding adhesion and permanence on a wide variety of materials, and is endorsed by leading designers, builders. T-88 has been the most widely used structural adhesive for marine and general woodworking use in the United States. When fully cured, it is unaffected by water, oil, kerosene, and many other chemicals. It will not stain wood and is immune to fungus and rot. T-88 is unique in that it may be applied to damp wood, provided it is worked well into the surface. Surface should be sanded and clean, dry and free of oil-based paint, oil, wax, dust and other contaminants. Do not wipe with tack cloth. Ratio by volume is 1 part resin A to 1 part hardener B. Ratio by weight is 100 parts resin A to 83 parts hardener B. Do not alter mixing ratio. Mix the resin and hardener together for at least 3 minutes. Large batches need longer mixing for uniform cure. Best results will be obtained @ 75º F. To avoid waste, mix only the quantity that can be used in 40 minutes. Pour, brush, or roll onto the surfaces to be bonded. Tack-free cure in 4-6 hours, and functional strength is reached in 24 hours. Caution! Vapors harmful. Keep out of reach of children. Refer to MSDS (22 KB) for further information.